Five years ago, the international court of justice in The Hague published its advisory opinion on Israel's separation wall in the Occupied Palestinian Territories (OPT). The keenly awaited verdict, requested by the UN's general assembly, was clear: Israel's wall is illegal, it must be removed and adequate compensation paid. 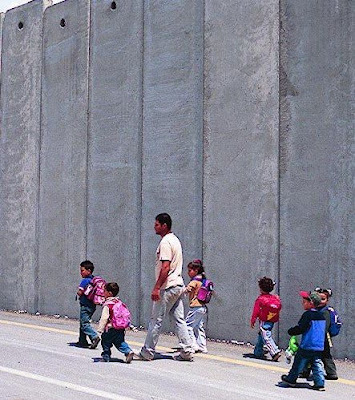 The wall's illegality, and Israel's obligation to dismantle the structure and pay damages for the consequences of the wall thus far, were all agreed by the judges by a margin of 14-1. (The ICJ also accepted the use of the term "wall", since "other expressions" are "no more accurate".) There was also confirmation that Israel's settlements were "a flagrant violation" of the convention, established "in breach of international law" (contrast this with the mealy-mouthed nitpicking over outposts and "freezes" by Barack Obama and Binyamin Netanyahu). 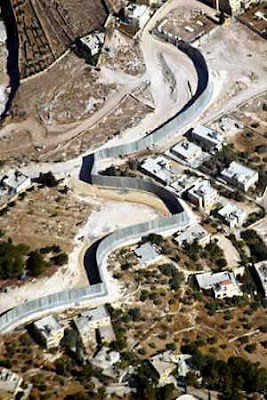 Overall, the court found that the route of the wall threatened to create "de facto annexation", with the wall itself described as severely impeding "the exercise by the Palestinian people of its right to self-determination". At the time, the ICJ decision was hailed by Palestinians and dismissed by the Israeli government. As Yasser Arafat described it as a "victory for the Palestinian people", a spokesman for the then prime minister Ariel Sharon, Raanan Gissin, opined that "after all the rancour dies, this resolution will find its place in the garbage can of history". Both the US and UK had opposed the entire process, on the odd grounds that the UN's main judicial body for settling legal disputes was not "the appropriate forum to resolve what is a political issue". In the words of Jack Straw, it was better not to "embroil" the ICJ "in a heavily political bilateral dispute". This opposition was rare – later that same month, the general assembly voted by 150 to six in support of the ICJ opinion. The decision was also welcomed by the likes of Oxfam and Amnesty International, with Oxfam's director adding that the ruling was a "step in the right direction" but needed "further action" by the international community. But meaningful "further action" was not forthcoming, and Israel pressed on with the wall. Five years on, the wall loops around the West Bank and cuts through East Jerusalem, isolating Palestinian communities and devastating lives, and has become an integral part of Israel's apartheid regime in the territories. About two-thirds of the 700km+ route, featuring a 8m-high wall, electric fences, sniper towers and "buffer zones" up to 100m wide, is completed or under construction. Of the West Bank and East Jerusalem, 8.5% will be on the "wrong" side of the wall. In terms of size as well as significance, this would be comparable to the UK losing Greater London and south-east England. For Israel to consolidate its hold on the illegal colonies in the OPT, many Palestinians find themselves hemmed in and surrounded by the wall's contortions (pdf). About 35,000 Palestinians with West Bank IDs are to be caught between the wall and the Green Line – if you add (pdf) the East Jerusalem Palestinians in the same position, this figure increases to about 260,000. These are the bare facts five years on from the ICJ opinion. Israel has ignored the judges' decision, but that's not a surprise. However, has the Palestinian leadership sufficiently exploited the opinion? Speaking to Palestinians involved in monitoring the wall's progress, or in directly resisting it on the ground, there is a feeling that Palestinian diplomats have not done as much with the ICJ result as they could have. Palestinians in communities directly affected by the wall continue to put up resistance, sometimes at their cost of their lives: 18 Palestinians have been killed by Israeli forces during anti-wall protests, the youngest victim a 10-year-old boy. While they fight for survival, the wall has also played a key role in changing the big picture, delineating the borders of the Palestinian enclaves Israel will grant "statehood". In 1994, the then Israeli prime minister Yitzhak Rabin said that "we have to decide on separation as a philosophy". However, this is not separation on equal terms – the following year Rabin also made it clear that the Palestinian "entity" would be "less than a state". There is a term for unequal separation in international law – apartheid (I will talk about this tonight). The wall urgently needs dismantling; but it is only one part of a bigger whole.